Saint Antony, Patriarch of Monks - My Catholic Life! Many extraordinary people who live heroic, path breaking lives remain unknown to posterity for one simple reason—no one writes their biography. How many other saints, heroes, and martyrs would be known to mankind if just one witness to their actions had put pen to paper! Just one author is needed to introduce a great man to subsequent generations. Today’s saint may have been forgotten forever, and may have wanted to remain unknown. But a talented and famous contemporary of his wrote what he knew. Saint Athanasius, the great champion of orthodoxy at the Council of Nicea, wrote a short biography of his fellow Egyptian, The Life of Saint Anthony the Great. Saint Athanasius’ work was so widely shared, and so often translated, that it was never lost to history. It has preserved St. Anthony’s memory down to the present. The first three centuries of the Church saw sporadic persecutions of Christianity which at times turned vicious. These spasms of violence against Christians produced a large class of martyrs, many of whose last words and sufferings were recorded in official Roman judicial documents or in the written testimonies of witnesses. As Christianity was legalized at the start of the fourth century martyrdom ceased to be the primary form of Christian witness. A new form of radical witness to Christ emerged—the witness of radical isolation, fasting, prayer, and penance of the desert fathers. These monks retreated into remote places to lead solitary lives of dedication to Christ. 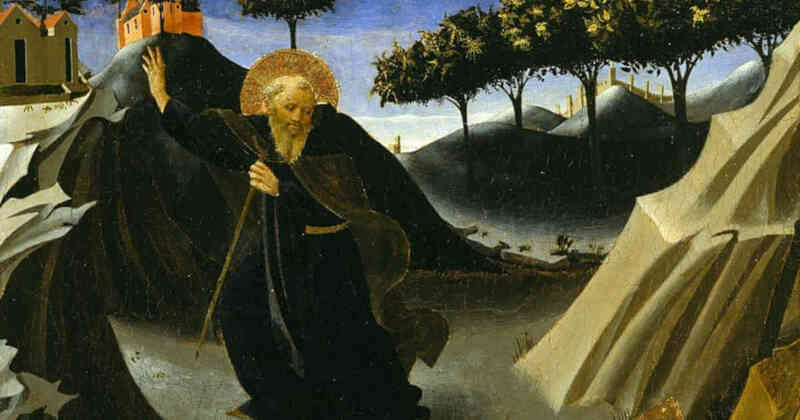 Foremost among these desert fathers was St. Anthony of the Desert, born around 250 A.D. He was not the first ascetic, but he was perhaps the first to take the radical decision to retreat into the desert. 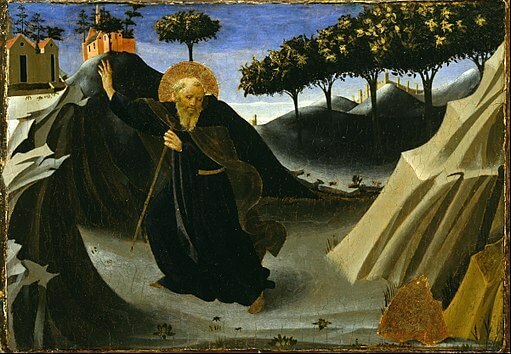 St. Anthony had money and property as a young man. But upon hearing at Mass the words of Christ to the rich young man to “…go, sell what you have and give to the poor, and you will have treasures in heaven”, St. Anthony decided to seek not silver or bronze, but pure gold. He sold his goods, he removed himself from all temptation except those intrinsic to human nature, he battled the devil, he fasted, he prayed, and he even actively sought martyrdom. He became famous for being holy. Saint Anthony preceded St. Benedict by two hundred years. He offers us an example of being a monk outside of a community of monks in a monastery. He sought Christ alone in every sense. Alone in the desert, without family, community, or money. Alone to the world, he clinged to the only person who truly mattered—God himself. Saint Anthony’s path of holiness is both radical and refined. It is for few people to walk. But he was the first to walk it so well. He shows us that being alone, stripped of all worldly concerns, is a sort of rehearsal for death, where we will meet God alone, every last thread tying us to the world having been cut. St. Anthony, we ask your intercession to help us cling to God alone. Help us to strip ourselves of those needs and concerns which stuff our lives from morning to night. Help us not to be distracted from the one thing, the only thing, the last thing, God Himself.